Oh, I'm drooling over this beautiful Office Furniture especially designed for a home office. I found this piece at Spacify.com and I think it's perfect for me. I have been telling my husband lately that I really want to have my own work table. As a student, I was used to having my own study table where I did my homework and studying. I have since left that wooden study table in my old room (the one that I used when I was still single and which is now the nanny's room -- oh lucky her!). Anyway, I think this office work table design is perfect for me. I need a table that has enough space where I could do my mommy duties: work on our weekly menu, market list, our household finances, my current side line. I also would need this to work on our chapel's finances (I am the assistant treasurer of our chapel council here in the village). Moreover, it would also be perfect when the time comes that I resign from my job and become a full-time work-at-home mom (WAHM). Oh that would be THE DAY! 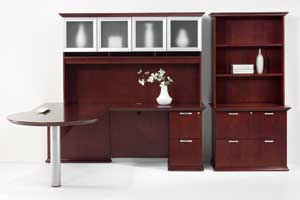 Personally, I really love the modern office furniture for the home at eRoomService.com.